Contemporary baby gear company bloom has introduced their latest addition to their Nursery collection. 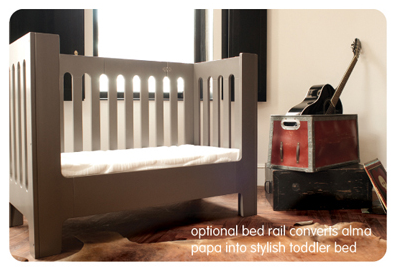 The alma papa line is perfect for parents who have limited space, but still want style. Suitable from newborn to 4 years, the modern solid wood crib has 2 mattress heights to allow it to be used as a co-sleep/Bassinet or full-size crib and just like it’s predecessor, the alma papa has an ultra compact fold for easy storage and transport. The bonus – when your toddler is old enough for a bit more freedom, the crib converts to be used as a stylish toddler bed. Also available is the sleek and modern alma dresser. Convertible from a sophisticated cabinet to a change station, this solid wood dresser features 4 large slow-closing drawers to hold all of your little one’s necessities. Kast van een Huis ~ Huge House Furniture For Little Ones!